Both light and darkness can have its comforting moments and its vital purposes. However living too long in one can create dis-ease and imbalance. We witness the universal shifts this month as we felt what happens when one crosses paths with the other. These shifts are not to be ignored, don't hide from them, accept them with open arms and understanding. Through hard times we climb to the easier path and to enjoy light we must first witness the dark. So it is with our practice on and off the mat. Give yourself freely to the journey, all of the ups and downs of it, shower yourself with compassion along the way. Take this practice off the mat, give yourself freely to your friends and family and shower them with compassion and love along the way. Big Bear hosts a FREE yoga festival every year and we are going! If you are interested in carpooling or staying with some of the members who are attending let Jesselle know and she will get you in contact with them! We will no longer be doing the Acupuncture clinic but will be switching back to doing our seasonal yoga and acupuncture starting in October! Our Autumn Equinox, when the days get shorter and the nights get longer. Our bodies begin to rest more. Crave a deeper sense of being. We cling towards our loved ones and burrow in for the winter. This particular equinox also falls so close to a new moon which lends to new beginnings and intentions. Let us celebrate and welcome this change with 108 Sun Saluations. This practice that is anchored in tradition will unite our yoga community through the power of moving mediation. Join Yoga Shine as we do 9 rounds of 12 salutations with savasana in between each round. There will be plenty of time and as always you may feel free to sit out a round, mediate or go at your own pace. We look forward to honoring this tradition with you all! "The deeper the roots the higher the tree can climb"
Journey with us throughthe lower Chakras to cultivate a strong foundation. We will use restorative yoga poses with accompanying oils to promote grounding, creativity and inner strength. 10% off all essential oil purchases! With more than 1 in 10 Americans on antidepressants, suicide the number one killer of teens, and addiction running rampant, our country is unsuccessfully navigating the inner human journey. This multifaceted workshop, consisting of live music and meditation, has helped so many achieve fulfillment through surrendering their resistance to being human. Join the women of your community to surrender what may be holding you back and consciously create the month ahead. Through visualization, journaling, sharing, and powerful conversation, the circle guides women to connect with the healing power of the feminine. $10 donation and bring a dish to share if you like! Celebrate life as an opportunity for constant transformation by using the chakras (subtle energies) as an effective roadmap to self-awareness and intrinsic power. Balance energetic instabilities and liberate your authentic self through postures and meditations specific to each chakra. Each restorative and yin pose is enhanced with the inhalation of therapeutic-grade essential oils, chakra meditations, reiki, and massage to melt the body into sweet surrender. If you sign up by September 23rd you will receive early bird pricing! Anne-Margaret and Anthony are a husband and wife team devoted to Raising The Vibration of the planet. They work with A-list celebrities, five-star hotels, and fortune 500 companies, providing wellness services designed to enhance the home and work environment. Since 2009, their yoga studio, The Giving Tree, has significantly raised the vibration of the most culturally diverse community in the world. After leading retreats and teaching workshops internationally in Asia, Africa, Central and South America, they now turn their focus homeward to a very divided nation. On May 15th, Anne-Margaret and Anthony began a 30-city US tour to Raise The Vibration of America. Spending one week in each city/town, they will work with local communities, teaching workshops on how to heal inner and communal divisiveness. Nicknamed "The Sunshine Goddess" by the Huffington Post, Anne-Margaret Redding is 'a genuinely inspiring person who takes advantage of every nanosecond to make a difference in the lives of others.' 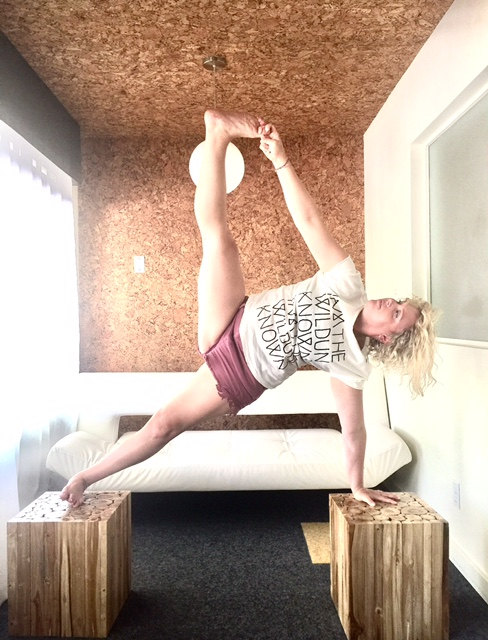 In addition to owning and operating a NYC yoga studio, Anne-Margaret is an international speaker, celebrity personal trainer, accomplished composer, spoken word artist, musician, and Interfaith minister. She is creator the Total Training Workout™, Chakra Yoga Teacher Training™, MMAD FEST™ (Musicians Making A Difference Festival), andwww.NewMoonWomen.org. Anthony Wood is certified in Kundalini Yoga (Hari Kaur), Chakra Yoga (Giving Tree), and a licensed massage therapist with over ten years experience in 5 Star, 5 Diamond Hotels (Four Seasons, Ritz Carlton). A graduate of the Swedish Institute, Anthony combines yoga and massage specializing in Deep Tissue Neuromuscular massage therapy with certifications in Pre-Natal and Thai massage. From an Eastern perspective, his work is heavily influenced by Taoist principles, Shiatsu, meditation and yoga. His Western influences include Myofascial Release, Craniosacral Therapy, and Reflexology. These amazing people are traveling through America to "Raise the vibration of the planet!" and they will be coming through Nipomo to our beautiful studio for one weekend only!